Beluga lentils. Where have you been my whole life? Really. Not around my parts as far as I know. I’ve lived without you for some 30-odd years, but I’m now determined to carve a niche for you in my heart. You’ve charmed me with you diminutive size, dusky color, and, certainly not the least of it, the way you remain perky when other lentils would have gone to mush – making you perfect for all sorts of salad-type preparations. Or just to have in the chiller, cooked and at the ready, for tossing into any impromptu lunch. I found and procured these beluga lentils on a recent trip to Barcelona. I had seen them in cookbooks and other blogs but, as they are not readily available here, have never tried them before now. We have other lentils, mostly the brown types. You can also find puy lentils in some specialty stores. But beluga lentils I have yet to come across. When I saw a jar of them at the spice stall in La Boqueria I was torn. My suitcase was getting dangerously heavy and I didn’t have any kilos to spare. I looked at the lady imploringly and asked, in my broken Spanish, what was the smallest portion she would sell me. I explained about my living on an island (ok, group of islands) in Asia with no beluga lentils, about my suitcase bursting at the seams, about my wanting to just have a taste of these famous lentils for once in my life. Moved by my story (or desperate to stop the barrage of my horrific Spanish) she packed a 250-gram bag for me. The most common use for lentils here is the Spanish dish lentejas, which is much like a soup or stew. For these little black pearls though I wanted a more delicate preparation that would highlight the beans more (as opposed to melting them away in a soup – albeit a delicious one!) and maintain their sprightly personality. I decided a more bean-salad type treatment would be ideal (as is really more popular with this type of lentils). And if bacon and balsamic roasted shallots are not quite so delicate, I think the deliciousness of this dish totally justifies the addition. – Place shallots in a baking sheet and drizzle with olive oil and balsamic vinegar. I don’t have exact amounts but enough to get the shallots good and coated. Season with salt and pepper. Place in a 350F oven and roast for about 45 minutes to 1 hour, tossing the shallots every so often so they brown evenly. You want them soft on the inside with sticky burnished outsides. 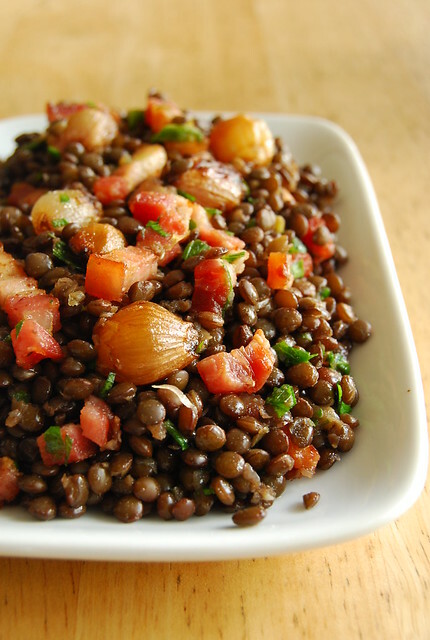 – While your shallots are roasting, place lentils and water in a pan, cover, and cook for about 25-30 minutes. Cook them just until soft, no further. Drain and set aside. – While the shallots are roasting and the lentils are cooking, heat a non-stick skillet over medium high heat. When hot, add the bacon and fry until some of the fat has rendered and the edges are toasty. – In a bowl whisk together the garlic, extra virgin olive oil, 1 teaspoon balsamic vinegar. Add salt and pepper to taste and whisk again. Pour dressing, parsley, and lemon rind over cooked and drained lentils and toss gently, taking care not to smoosh the lentils. Add cooked bacon (and some of the bacon drippings too!) and roasted shallots. Toss gently again. Top with sun-dried tomatoes and cheese if using. I absolutely love the way beluga lentils hold their shape when cooked. They are ideal in a salad, although what you add is completely up to you and your imagination. I think beans and bacon are a magic combination (although I could be rightly accused of thinking that anything with bacon is a magic combination) and the balsamic roasted shallots, all soft and sweet and sticky, do well with the lentils’ earthiness. You can pile a bit on a sundried tomato and top with some fresh white cheese for a tasty appetizer, or you can just toss the tomato and cheese with the beans as part of the salad. Goats cheese would be excellent, but my organic farmer gifted me with a circle of fresh cottage cheese that they have just started making so I used that instead***. I imagine this would also be good atop some brown rice with a splodge of garlic-herb yogurt. Now, if only it was easy to find them here. If only I didn’t have to cross an ocean to obtain some! I remain optimistic however. I will search every specialty food store and delicatessen until I find these lentils. We will meet again my friend. ***SO excited that my organic farmer has started offering cheese! This batch was firm and creamy and perfect in thick slices atop warm toast with a drizzling of honey. such a lovely salad!! I also want to incorporate more lentils in my diet. i need to find some to try. They sound wonderful. I'm swooning with you! I love these lentils too. Your dish is gorgeous Joey! Wow, this sounds like a delicious combination! Thanks Rosa! Yes, it is definitely a great pairing! Looks absolutely delicious! And boy, you take really great food photos! Both delicious photos there! I love lentils too; they are so healthy and such a lovely texture. Thanks for sharing your recipe. I had to do a double-take: I could have sworn those wee beads on the platter were caviar and not lentils! I can just imagine how fabulous this dish would be as a side for a chicken tagine with preserved lemons – sublime! Yum! I adore lentils! Especially in salads such as this one. Hi Katiez! Six hours away and your 2nd favorite city…why wait! 🙂 I would love to be closer to that awesome market myself! Hi Midge! They are truly wonderful…now to hunt for some enterprising importer! Oooh, sounds good with a chicken tagine…mmm! I have honestly never had these type of lentils before, thank you for introducing them to me = ) The dish looks so alluring and delish, the photos look superb too! wow, amazing! I am going to try this in the next few days, but maybe with puy lentils instead… i'm living in egypt right now and my arabic is basically non-existent so when it comes to certain kinds of food, i just have to eyeball it and guess. on that note, if anyone knows the arabic word for beluga lentils, please share!! OMG that looks delicious! 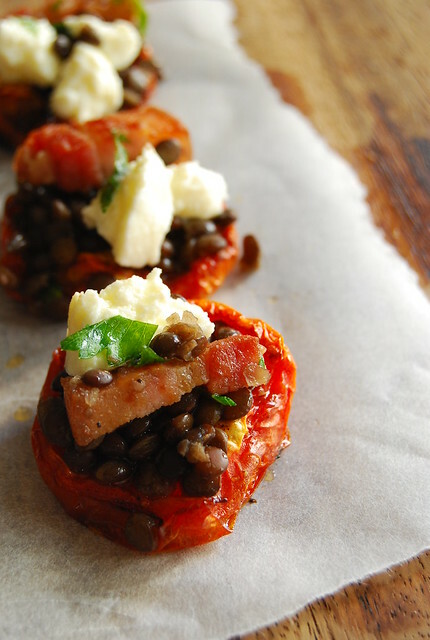 I like the way you started your post — An "ode" to the beluga lentil. ("Where have you been all my life…) Happy Friday! I love your blog! It inspired me to cook and write again. 🙂 Thank you! This recipe looks divine and I agree that Bacon and beens are wonderful together! Hi myFudo! Thank you! This was my first time to have them…and they were delicious! Hi Lori! Egypt! A place that has always enthralled me! I have been once and I would love to immerse myself a bit more 🙂 I hope you find beluga lentils over there!